In marketing, STP stands for market segmentation, targeting (or target market selection) and product positioning. Most marketing textbooks will show the STP as three broad steps. 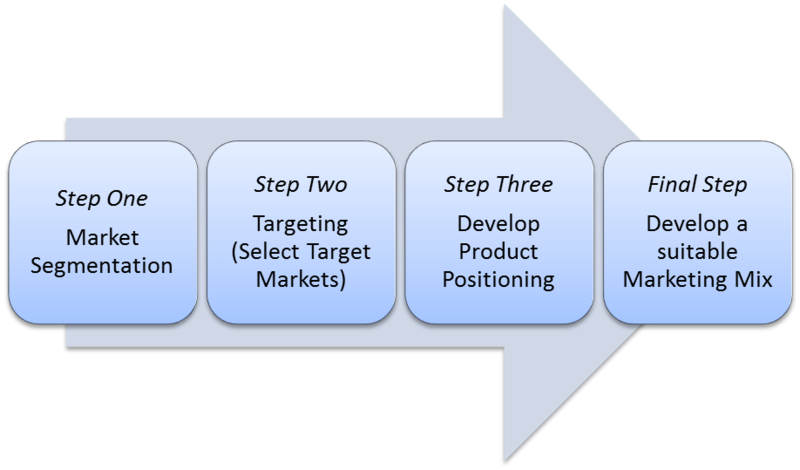 In the following diagram, the three foundation stages of segmentation, targeting and positioning are shown, along with a final implementation stage of marketing mix development. It is important to understand that the STP process (the first three stages) is always followed by the development and implementation of a marketing mix. A good way to think about the STP process is that it is a analytical approach that helps the firm make important ‘where’ (target market selection) and ‘how’ (product positioning) to compete marketing strategy decisions. Therefore, the additional of the fourth stage in the diagram simply highlights the need to effectively execute these strategic decisions. Based on this market segment analysis and evaluation, the firm will select one or more of the market segments to form part of their marketing program. The market segment that they select is then referred to as a target market. Therefore, a target market is simply one of the many market segments available to the company that the firm has deliberately selected for the purposes of their marketing programs. After selecting a target market, the organization needs to consider how it will construct its marketing program to achieve success. There are two parts to this as shown in the diagram above. The first is positioning, which is how the firm wants its products to be perceived (understood) by consumers in that particular market. (For more details, please refer to What is positioning?). Once the desired positioning has been determined an appropriate and supportive marketing mix then needs to be developed and implemented by the firm. For a greater understanding of the STP model, you should review the Full STP Process.